This interesting oil on canvas painting is by British artist Arthur Royce Bradbury. Painted in 1939 the painting shows the harbour of St Ives in Cornwall at low tide. In the foreground is the boat PZ 178 from Penzance with all its rigging and lights detailed and around it a few smaller rowing boats. Behind are the waterfront buildings of St Ives including a church. The scene is very atmospheric and lit by an evening glow as per the title. Signed and dated lower left. 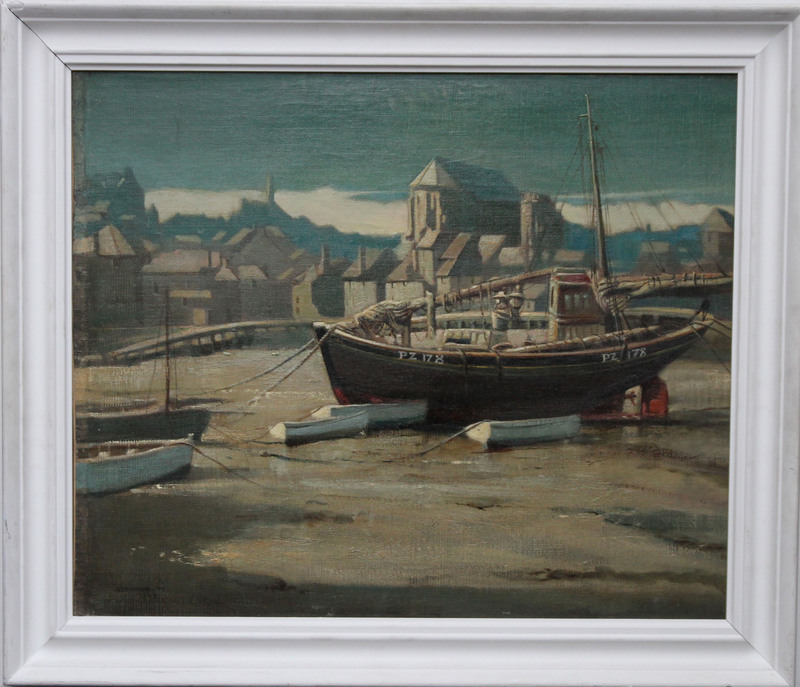 Housed in a complimentary frame 26 inches by 22 inches and in good condition. Arthur Royce Bradbury (1892-1977) was born on the 17th September 1892 in Preston, Lancashire. 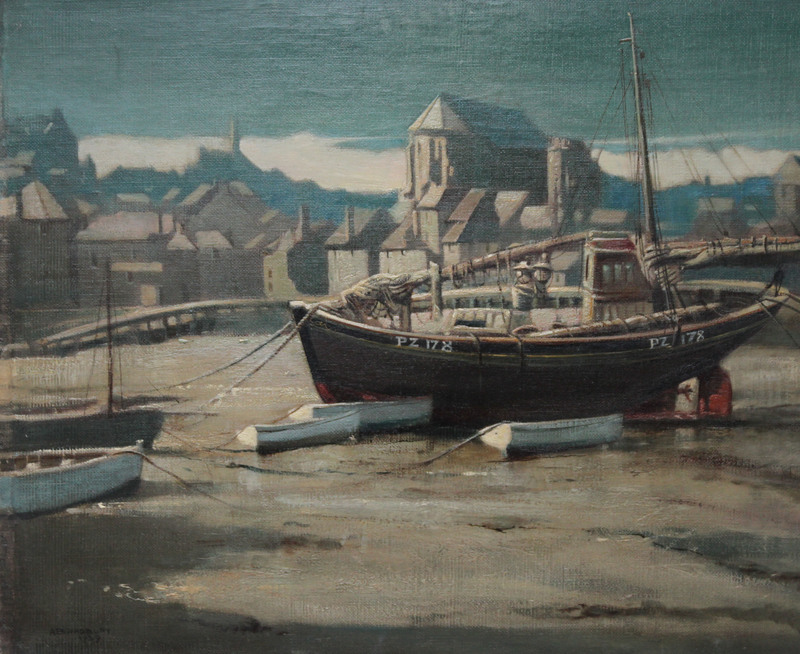 He specialised in painting portraits, landscapes and marine scapes in oil, watercolour and pastel. He was also an accomplished etcher and teacher at the Pembroke Lodge School and Wimborne Grammar School. He studied at the St. John’s Wood School of Art before being accepted at the Royal Academy Schools. In 1913 he is recorded as living at Bournemouth, then Parkstone, Dorset in 1915 before finally settling in Poole for many years. He served as a cadet in Mercantile Marine serving for them on the West African trade route, before taking up art. It was then that he made several voyages on the barquentine ‘Waterwitch’ carrying coal and china clay from Cornish ports. The ‘Waterwitch’ was the last trading square rigger in British service at that time. He became an Associate of the Royal West of England Academy and exhibited there and widely elsewhere, mostly portraits. He first exhibited at the Royal Academy in 1913 a work titled ‘Iris’ and went on to exhibit fourteen works there. Examples of his work may be seen at the Liverpool and Brighton Public Art Galleries.